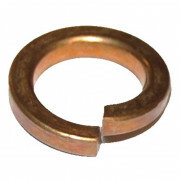 Spring washers are a left-hand helix and allow the thread to be tightened in a right hand, clockwise direction. When a left hand turning motion is applied, the raised edge bites into the underside of the bolt or nut and the part that it is bolted to, resisting turning. 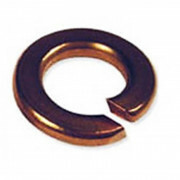 Spring washers are ineffective on left-hand threads and hardened surface, they should not be used in conjunction with a flat washer under the spring washer, as this isolates the spring washer from biting into the component that will resist turning. Spring Washers of which the most popular is a Spring Lock Washer to DIN 127B are shown here along with Din127A and DIN7980.